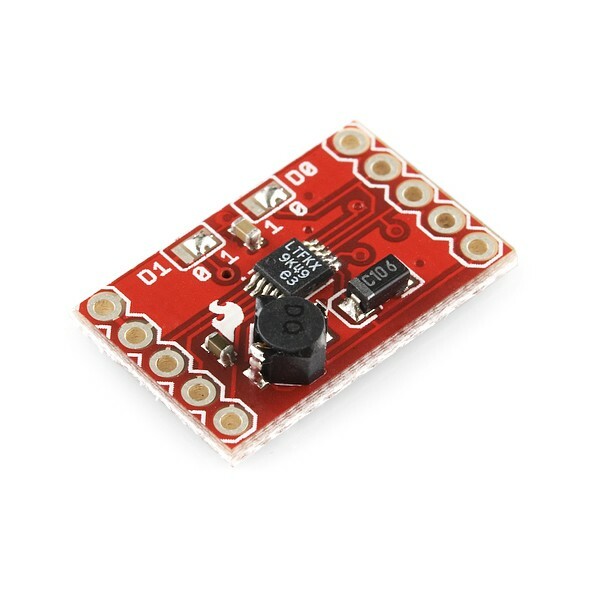 This breakout board uses the LTC3588 Piezoelectric Energy Harvester from Linear Technologies. This board can be used not only for harvesting piezoelectric energy, but solar energy as well. There is a bridge rectified input for piezo elements (PZ1 and PZ2) and a direct input (VIN) for DC sources. Both are clamped to 20V. In addition, the board can simply be used as a standalone nanopower buck regulator. An ultralow quiescent current undervoltage lockout (UVLO) mode with a wide hysteresis window allows charge to accumulate on an input capacitor until the buck converter can efﬁciently transfer a portion of the stored charge to the output. In regulation, the LTC3588 enters a sleep state in which both input and output quiescent currents are minimal. The buck converter turns on and off as needed to maintain regulation. Four output voltages (1.8V, 2.5V, 3.3V and 3.6V) are pin selectable with up to 100mA of continuous output current. However, the output capacitor may be sized to service a higher output current burst. An input protective shunt set at 20V enables greater energy storage for a given amount of input capacitance.